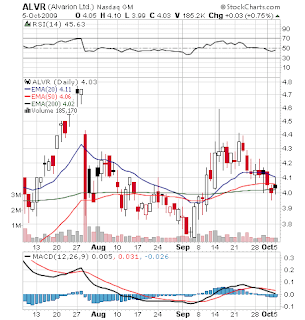 Alvarion (ALVR) continues to be one of the most disappointing stocks in our universe. ALVR is a mobile internet play for emerging markets. How doesn't it just soar based on that thesis? Even considering you need more then that, ALVR is a dominant player in the WIMAX market and continues to have huge potential in the emerging markets. Zacks has remained bullish on ALVR over the last month or so. ALVR is extremely cheap but issues remain with the future of WIMAX. Nothing really new in that camp. Regardless, we agree with Zacks and would recommend buying at these levels.